Select if you want to Monitor an entire Group of athletes, or if you want to select specific Athletes (you can have both athletes and groups set up). To add a single athlete go to the Monitored Athletes section. #2. Once the Athlete's name (e.g. 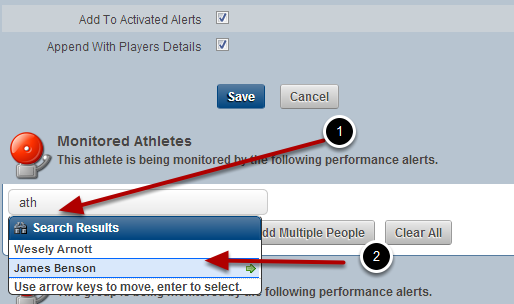 James Benson) appears in the text box you need to click Add monitored athletes (shown in the image in the step below). 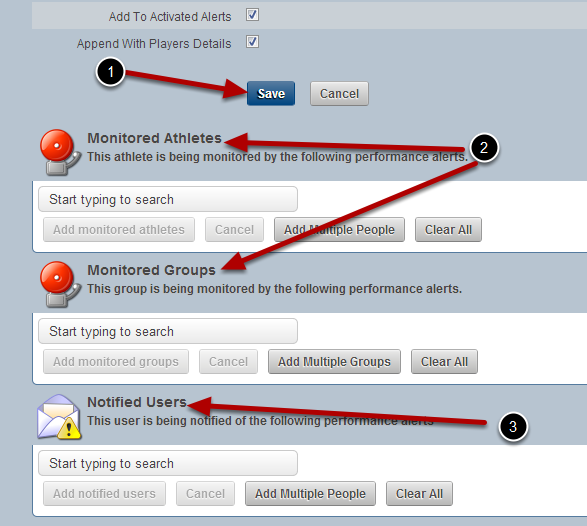 #2: Click on "Add People"
These user will be added to the monitored athletes list. 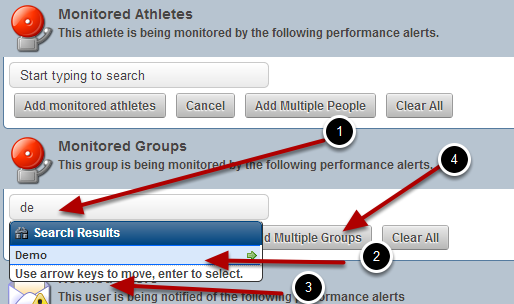 If you want to Monitor an entire Group of athletes go to the Monitored Groups section. Just as for a single athlete, you can type in the name of the group and add in one group at a time. 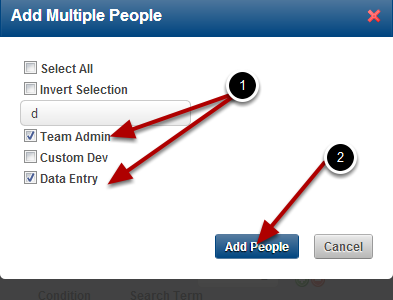 Or, you can click on "Add Multiple Groups" and add in multiple groups. #1. Type in the name of the Group into the search box. #4 Click on "Add Multiple Groups" and select multiple users and click on "Add Groups"
Now choose who needs to get Notified when the alert criteria is triggered? #2: Once their name appears in the text box, click "Add notified users"
#3: If you want multiple people to be notified, select the "Add Multiple People" button and put a tick beside the users names who you want the notification to go to and click "Add People"
You can also clear the entire list by clicking on "Clear All". The list will be cleared and you can start again. What if I added athletes to the notified users list, or Coaches who do not have access to the Event Form or Athletes? 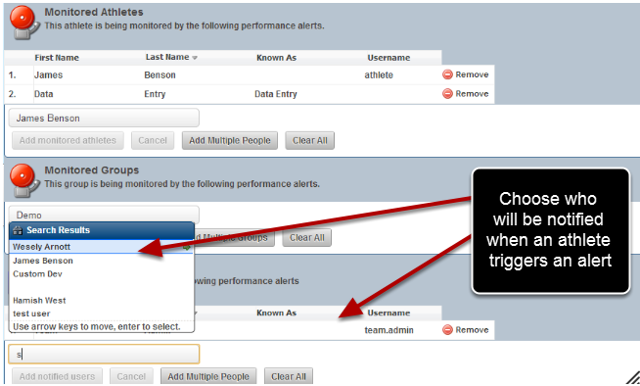 The Performance Alerts follow the same permissions structure that is set by your administrator. You can set up users to receive notifications for alerts, but if they do not have access to the users data (Event Forms) or to the monitored users, then the alerts will simply not be sent to that user. Alerts are only set to users who can access their own data (e.g athletes) or to Coaches with access to the athlete and event form being used to create the alert. This message is showing that text is in a search box and it is checking whether you want to add in the user to the list, e.g click on "add monitored athletes" to add in Hamish West to the list of monitored athletes. All of the Performance Alerts that you create will be available to view, edit and delete from the Performance Alerts List (access from the Home page by click on "Performance Alerts, then "Set up Performance Alerts"). To see what happens when alerts are triggered, see the next section.